There is a large amount of information to consider when buying a gun safe, and many people have no idea where to begin. Finding a secure home for your valuable, and in some cases irreplaceable, guns could cost more than the firearms themselves. A quality safe is worth every cent you pay for it, though, because it not only protects your precious investments, but it also keeps your guns from falling into criminal hands. While shopping around, look for the following characteristics that differentiate high-quality products from lower-end models. 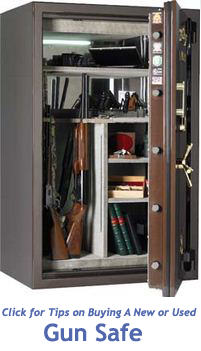 Gun safes have special features, including extra space for long firearms and protection from the elements. They are usually taller than they are wide, allowing tall guns to stand on end. Additionally, you can store ammunition, jewels and other valuables in special trays or on shelves. 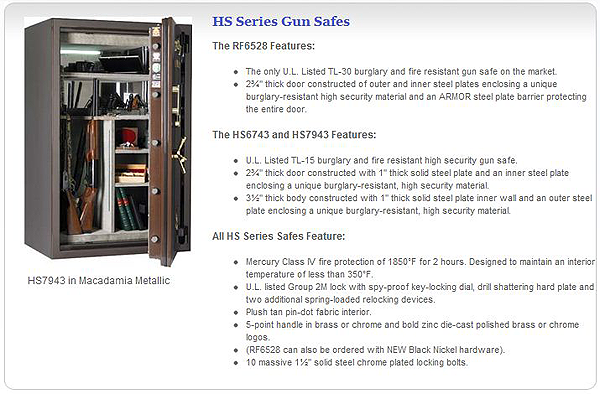 Gun safes come in a variety of different configurations and price points, depending on various factors. As with most things, expect to pay a higher price for more secure, well-built safes. How Do You Differentiate Gun Safes? Sizes vary, and some people have just a few handguns to secure, while others have extensive collections of firearms. Some people choose small gun safes that can be installed in a wall or the floor. 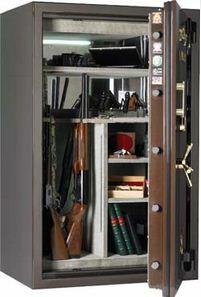 Many gun owners buy a larger safe with room to accommodate future gun purchases. Larger models also make it much easier to remove one firearm without having to take all of the others out, especially if you have a large collection that would be packed like sardines in a smaller safe. The thickness of walls and doors varies. Some stores sell “security cabinets,” which have thin sheet metal walls, rudimentary locks and no fire or flood protection. If secured to the floor or wall, these offer some protection from burglary. 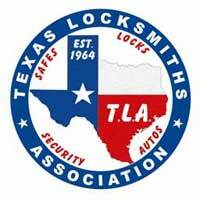 There are different types of locks available. You can gain quick access with a fingerprint recognition lock or electronic lock. Many people prefer the security and reliability of manual combination dial locks. Manufacturers have their safes tested by Underwriters Laboratories (UL), and earn different levels of certification from them for an approved residential security container. The higher the UL rating, the more secure the safe. Do I Really Need a Gun Safe? If you own firearms, you need to buy a gun safe. Several states, including California, could hold you liable if your firearms are stolen because they were not properly secured. Additionally, unfortunate and unnecessary deaths have occurred when children find unsecured guns in the home and use them for play without understanding the potential ramifications. If your home should catch fire, or be subjected to flooding from an internal plumbing issue or natural disaster, your assets need proper protection. Firearms are also susceptible to damage and corrosion, causing your investment to devalue over time if your gun collection is stored in a moist, unprotected environment. No home safe is ever completely burglar-proof, but a high-quality model provides security because it takes much more time to access, and most burglars are in a hurry to move on. Buyers should beware of the burglar that carries a dolly with them. Some experts recommend safes that weigh at least 750 pounds, with an additional 200 pounds or so of firearms inside. Additionally, bolting the safe to the floor makes it quite secure. Fire is one of the dangers that poses more of a threat to your guns than theft. A priority feature for many gun owners is a high fire rating. UL bases fire ratings on maximum temperature allowances inside the safe. Typically, during a fire, exterior temperatures rise quickly to 1,200 degrees and hotter. UL ratings are based on keeping the interior of the safe at a range from 125 degrees to 350 degrees. This is cool enough to protect firearms and other valuables, including paper money and important documents. A safe’s endurance, or how long until it exceeds its temperature rating, and explosion endurance, are also assigned rating factors. Smaller safes usually provide 30 minutes of endurance before the inside temperature exceeds the rating. Better safes have from one to four hours endurance time. Some manufacturers sandwich a special type of sheetrock in between heavy steel plates for the walls as effective insulation against heat. This also pressurized the interior of the safe and forms a heat shield against the door using seals that expand in the heat. Some safes have interior fire-resistant liners that provide fire protection; they do not hold up as well to prolonged or extreme heat. the lock. Also, pay attention to the number of bolts the steel door has for various models. If a door has an adequate number of bolts, it will stay on, even with the hinges completely sawed off. Many manufacturers offer security products for firearm protection. AmSec has been in the business of building high-quality safes since the 1940s. They originally set the standard in security protection with the round vault door. Today, safe doors have changed to square or rectangular, and AmSec uses features such as steel and concrete and secure boltwork to gain the highest fire-resistance ratings and make their products stand above the rest. AmSec safes come in a variety of models, and can be tailored to fit your unique needs. Optional add-ons include electric and battery-operated lighting kits, door organizers to maximize space and keep small items compartmentalized, adjustable standing gun racks, smaller racks for holding pistols and electric dehumidifiers or packaged dessicant for safes with no electrical access. There are many details to consider when buying a gun safe. Keep the above information in mind, and assess your personal level of need for security. Buy the highest quality safe you can afford as an investment that will protect your kids, your firearms and your peace of mind. We recommend AMSEC Gun Safes as the best value. Here are some specifications to help you decide what is best for you. 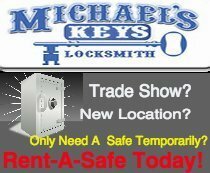 Call us today for more information or to order your safe. 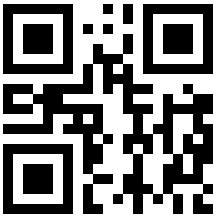 817-749-2041 in Fort Worth or 972-498-1026 throughout the Mid-Cities area.